Summer is almost upon us. With that comes more time outside playing at the park, walking the dog, or taking the family out on the lake. With this increase in time spent outdoors and the change in temperature, it’s an important time to check and make sure you family is protected. Parasite prevention for our companion animals during this time is very important. Families should be gearing up to get their pets on the proper medications or continue or add additional products as needed. If your pets have not been on preventative medications for these common parasites make an appointment with your veterinarian now and get the needed tests to get started today. The next couple posts will deal with some of the common parasites seen in companion animals, their lifecycle, and their potential effects on humans. Roundworms: This is a common parasite seen in puppies. It looks like spaghetti and can be vomited up or passed in the feces. Roundworm eggs live in the soil. These eggs were shed in the feces of an infected animal. Another dog, cat, or human comes along and ingests the eggs from the environment. This can happen when animals lick the ground or eat another animal’s feces, or when humans, often children, put things in their mouths after playing on a contaminated playground etc. 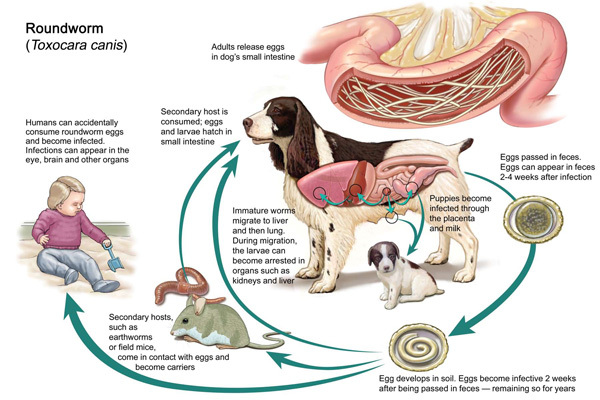 Eating another small animal that has ingested the eggs, such as a rabbit, or being born to an infected mother can also infect companion animals. The eggs then become active in the host and hatch into larvae that migrate around the body through the lungs and liver, and eventually to the small intestine (CAPC, 2013; CDC, 2013). They grow into adult worms that live in the small intestines of the host and lay eggs, which are passed in the stool to start the cycle over again. Some medical problems associated with roundworms include a pot-bellied appearance in puppies, diarrhea, cramping, poor coat, and failure to gain weight (CDC, 2013). Hookworms: Hookworms live in the small intestine of the animal where they lay eggs, which are shed into the environment. Here, outside the host, they developed into infected third stage larvae (CAPC, 2012). The larvae get back into the host thorough ingestion, penetration of the skin, or from eating another infected host. They can also be passed on from mom through the placenta or milk as with roundworms. The larvae travel around the body and are eventually swallowed or go directly to the small intestine and grow into adult worms, where they attach and feed on the blood and tissue of the animal, and begin laying eggs starting the cycle again (CAPC, 2012). Medical problems include anemia, diarrhea, poor coat, and failure to gain weight in young puppies. Some can actually die if they have a heavy worm burden (CAPC, 2012). Children are especially vulnerable to roundworms when allowed to play in dirt and sand where animals defecate. They accidentally ingest the eggs that may have been deposited in the soil. Kids should be monitored closely when in areas where there may be contamination, and should be strongly discouraged and taught not to put things in their mouths outside, and always wash their hands after playing (CDC, 2013; CAPC, 2013). Roundworms cause visceral and ocular larva migrans, where the larval travel around the body to different organs causing hepatomegaly (enlarged liver), pulmonary disease, eosinophilia, or neurologic disease, or into the eyes possibly causing blindness (CAPC, 2013). Hookworms are contracted usually by walking barefoot outside; playing is contaminated sandboxes, or working in moist garden soil. They cause cutaneous larva migrans in humans, which can also be described as a creeping rash (Dilillo, 2011; CAPC, 2013). These worms, and many that we will discuss can be prevented with a simple monthly treat or topical medicine. Prevention is the key and can save a lot of money and hardship. It takes a lot to destroy the eggs of the parasites in the environment. Things like steam, prescribed burns, removal of the topsoil, or pouring concrete or asphalt over the area of the more hardy species may remove the eggs, but overall prevention is the key (CAPC, 2012). Check with your local veterinarian to see what products they are using and which ones are safest for the whole family.